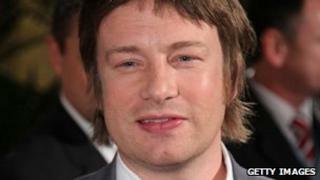 Jamie Oliver's latest cookbook has become the fastest selling non-fiction title of all time. Jamie's 30-Minute Meals has sold 735,000 copies in 10 weeks, beating the previous record held by comedian Peter Kay's memoir, The Sound of Laughter. In the past week, its sales were more than twice that of its nearest rival, Guinness World Records. Delia Smith's How To Cook (Book 1) is the bestselling cookbook of all time, with more than a million copies sold. Jamie's 30-Minute Meals, which contains recipes for 50 quick three-course dinners, was made into a television series for Channel 4. The past week has been the biggest for sales so far, with 110,000 copies bought. Tom Tivnan, features editor of The Bookseller magazine, said: "It really is quite phenomenal to have sales like that when the TV series is finished and the book has been out a few weeks. "I am pretty sure it will go on to be the biggest selling cookbook ever." According to official figures compiled by The Bookseller, the second placed title, Guinness World Records, sold just 50,444 copies in the past seven days. In third place in the overall chart was The Simples Life, by The Meerkat, with sales of 37,640. Mr Tivnan said cookbook sales as a whole had flattened off in recent years, but there was certainly "much more of a foodie interest" in Britain now than a decade ago. "There are really four or five cookbook writers who dominate the market and they're the ones we know by their first name - Jamie, Delia, Gordon, Nigella," he told the BBC. "But I think accessibility is really the key to Jamie's success. He almost single-handedly introduced the idea that you could have great meals without spending hours and hours cooking. "I also think he's really matured. He's become a national treasure rather than the 'pukka punk' he used to be." Although its list price is £26, many shops are offering discounts of up to 50%. Penguin UK, which publishes the book, said it was "thrilled" at its success.